Exxir Capital and others are going back to the way communities were built before the automobile had people flocking to the suburbs. The weather is brisk as Michael Nazerian and I walk through the half-built buildings that will become Bishop North, the latest phase of his $350 million mixed-use development in North Oak Cliff. We’re dreaming of warmer days, and imagine people wandering beneath the boughs of trees and down pathways made for human feet instead of steel carriages. Nazerian stops to show me the large, old tree for which he sacrificed 20 potential apartments. He’s steeped in the teachings of urbanist Jane Jacobs, and it shows is every detail of Bishop North, down to its door handles and street pavers. 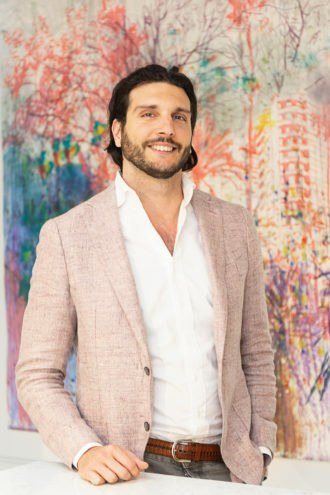 Chief operating officer at Exxir Capital, a family-owned business led by his father Farrokh, Nazerian is on a mission to create the kind of neighborhood that makes people want to stay for generations: walkable, safe, local-business-friendly, and equitable. The point of life, he says, is to connect and form relationships. Public spaces are where a lot of those connections occur, and to allow for them, you have to design places in a way that makes people feel comfortable. It also means finding a way for a variety of uses to work in harmony. At Bishop North, residences have been designed to have their living spaces “on the glass,” overlooking the street, to add more energy to the streetscape. Retail spots are reserved for a carefully curated mix of local businesses. Amenity spaces aren’t hidden in an interior courtyard but placed directly on the street and open to everyone. The strategy is to invite the community inside and give residents a reason to come outside. It’s all about the spaces in-between. When finished, Exxir Capital’s overall Bishop Arts district project will include nearly 1,600 apartments, 84,000 square feet of residential and retail space, 112,000 square feet of office space, and 140 hotel rooms. Nazerian’s development sits on 12 acres, painstakingly assembled, bit by bit. When deciding where to develop, he picked Oak Cliff over places like Uptown because of its roots. Family trees grow strong and wide in the neighborhood, and he wanted to be part of that living web, working to strengthen the neighborhood from the inside. He has been a resident of Oak Cliff since he bought a pale blue home on Bishop Avenue 12 years ago. It sat across from a shuttered house he thought was most certainly a crack den. Years later, when he was in the process of buying that house as he amassed property, he learned why so many people used to walk in and out of its doors every day. Inside the old haunt was an armada of vintage refrigerators, the kind you might see in movies set in the 1950s. The refrigerators held a substance far more innocent than the crack Nazerian imagined: beer. Lots and lots of beer. Nazerian is part of a new class of developers returning to the way communities were built in America before the automobile had people flocking to the suburbs. In the 19th and early 20th centuries, “walkable urban” was the form of the day in metro cities and streetcar-driven neighborhoods like Oak Cliff. Change began locally in the 1990s, most notably in Uptown and Sundance Square in Fort Worth. The trend percolated for a while but more recently has been accelerating; driven by a convergence of strong demand and a growing acceptance by lenders, walkable urban is on track to become the dominant form of new real estate. That’s the word from Christopher Leinberger and Tracy Loh of The George Washington University, who conducted a study on these walkable urban places, or WalkUPs as they’ve dubbed them. Leinberger and Loh classify a WalkUP as an urban area with a minimum walk score of 70.5, an average intersection density of greater than or equal to 100 intersections per square mile, a minimum of 1.4 million square feet of office space and/or 340,000 square feet of retail space. The most striking indicator of this type of development’s success is its sheer economic efficiency. Across North Texas, there are 38 WalkUPs, including places like Uptown, Knox/Henderson, Preston Center, Deep Ellum, Fort Worth’s West 7th, and the like. Combined, they make up a paltry 0.1 percent of the land mass in Dallas-Fort Worth, yet they account for a whopping 12 percent of its GDP. In terms of overall efficiency, this means WalkUPs are 112 times more productive than any other type of development. People are hungry for the connectivity that pedestrian-friendly communities provide. They want to live and work in dynamic places—and the market is responding. DFW’s 38 established WalkUPs accounted for 26 percent of the multifamily units added since 2010. Apartment occupancy across the board in the metro is holding at around 95 percent—which means there’s demand to support it. In fact, demand for walkable environments is so strong, Leinberger estimates it will take two or three decades of development to catch up. The payoff is there. Leinberger’s and Loh’s study, which is available online, found average rents in income-producing properties (office, retail, and multifamily) within WalkUPs to be 37 percent higher than the regional average. The neighborhoods also purvey a softer benefit: social equity through access to transit and a wide mix of housing options. The bad news for DFW: We’re behind the trend—and our sprawl is real. As mentioned, walkable urban accounts for just 0.1 percent of our region’s land mass. This compares to averages that range from 1.5 percent to 5.5 percent in other metros.